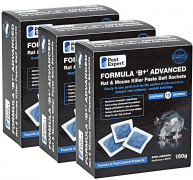 Formula 'B' Rat & Mouse Poison Paste Bait is a ready-to-use maximum strength rodenticide supplied in handy sachets for the rapid eradication of rats and mice. 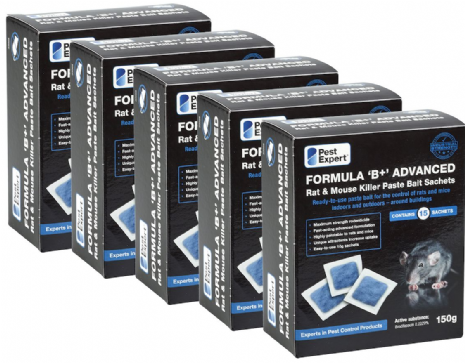 Formula ‘B’ Paste Bait contains maximum strength Brodifacoum (0.0029%) – a single-feed anticoagulant with immediate results for fast and effective rodent control. The unique blend of ingredients creates a highly palatable formulation which is irresistible to rats and mice, with added attractants to increase bait uptake. In addition, the oil scented compounds in the paste help retain moisture and freshness, keeping the bait palatable for longer, and encouraging feeding in areas where water is not otherwise available. Recent studies found Formula ‘B’ Paste Bait to be 7-8 times more palatable to rodents than food found in grain stores, stables and residential areas. This makes it especially suitable for use in places where there is an alternative food source, and where control with other poisons has failed through low uptake. For rat infestations: Use bait points of up to 200g. Place bait points 10m apart reducing to 5m in high infestations. Do not move or disturb bait points for several days after laying bait. If no signs of rat activity are seen near the bait after 7-10 days, move the bait to an area of higher rat activity. For mouse infestations: Use bait points of up to 40g. 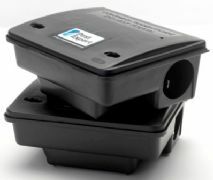 Place bait points 5m apart reducing to 2m in high infestations. Mice are very inquisitive and it may help the control program to move baits every 2-3 days at the time when bait points are inspected and/or topped up. We recommend use in tamper-resistant bait boxes to prevent access by children and or/pets and non-target animals. Excellent Service !! Couldn't fault the service, prices, efficacy of the poison and convenience! Great company! Competitive price, great delivery and fantastic poison! Brilliant product! Pest-Expert never disappoint. They always deliver the best products and this paste bait was great! Best mouse poison on the market! We've tried several but nothing compares to Formula B! Very good! Product arrived promptly with very clear instructions and the poison was very effective! Great service, very fast. Would recommend this poison to anyone with a mouse problem! Fantastic stuff! Within a week all the mice were dead - just what the Dr ordered!